At Mid-Autumn it is a traditional activity to find a good place to admire the full moon. 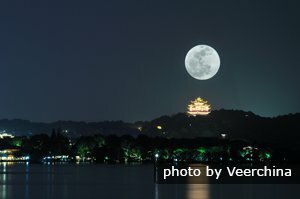 Here are the three best places to admire the full moon in Hangzhou. Three Ponds Mirroring the Moon on West Lake. Three Pools Mirroring the Moon is the NO. 1 classic moon-viewing spot in fall of China. It&apos;s shown on the 1 yuan banknote. It is also one of The Ten Classic Scenes of West Lake. On Mid-Autumn Day in Hangzhou Three Pools Mirroring the Moon is the one of the best places to be (so it will be very crowded). The viewpoint is on an interesting island, which contains four ponds. 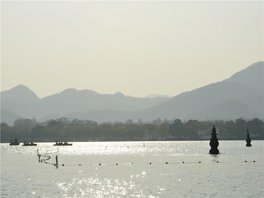 There are three mini pagodas in West Lake. When Mid-Autumn Festival comes, local people light candles in the mini pagodas and cover the holes with tissue paper. The light from the holes in the mini pagodas looks like reflections of the full moon in the lake. When a bright moon is in the sky, moon light, candle light, and reflections on the lake, enhance each other&apos;s beauty. Then the reflections of the moon and the mini pagodas mix together, and create a true embodiment of the classic description of this attraction: "a moon in the sky and three mirror images in the lake". Take a boat (around 55 yuan) from Lakeside (Hubin) park, Zhongshan Park, Yue Fei Mausoleum, or Fish Viewing at Flower Pond. Yueyan (&apos;Moon Stone&apos;) is located south of Shengguo Temple on Fenghuang Mountain. Walking along the path from Yueyan, up the steps, you can see the whole sight of Yueyan: a sheet of cliff, a stone, a cave and a Song Dynasty (960–1279) style pond. There are three lanes around the cliff, quiet and beautiful; it is truly a perfect place to admire the full moon. On Mid-Autumn Day, the moon light passes through a hole in the stone, and two moons appear, one in the sky, one on the ground. Yueyan is the old haunt of the royal palace of the South Song Dynasty, and it became the place to admire the full moon for nobles 800 years ago. The beautiful full moon on the Mid-Autumn Festival. Hangzhou is well-known for West Lake&apos;s Pinghuqiuyue (‘Calm Lake Autumn Moon&apos;), one of the best places to admire the full moon. Pinghuqiuyue, on the south bank of Bai causeway (Baidi), is another of The Ten Classic Scenes of West Lake. It was once the private garden of Silas Aaron Hardoon, who was a wealthy businessman and well-known public figure in the city of Shanghai in the early 20th century. In 1959, the local government reconfigured its layout and added extensions to some buildings, and then it became a famous scenic spot for the public. On Mid-Autumn night, the full moon shines upon the mirror-like lake, quiescent and charming. If you want to visit these places in Hangzhou to celebrate the Mid-Autumn Festival, contact us and we can provide you help arranging a tour according to your requirements. 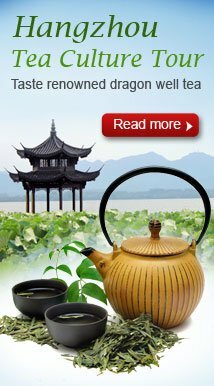 We specialize in tailor-making China tours.